Use the Napoleon Super WAVE Grill Brush as part of your regular grill maintenance routine. 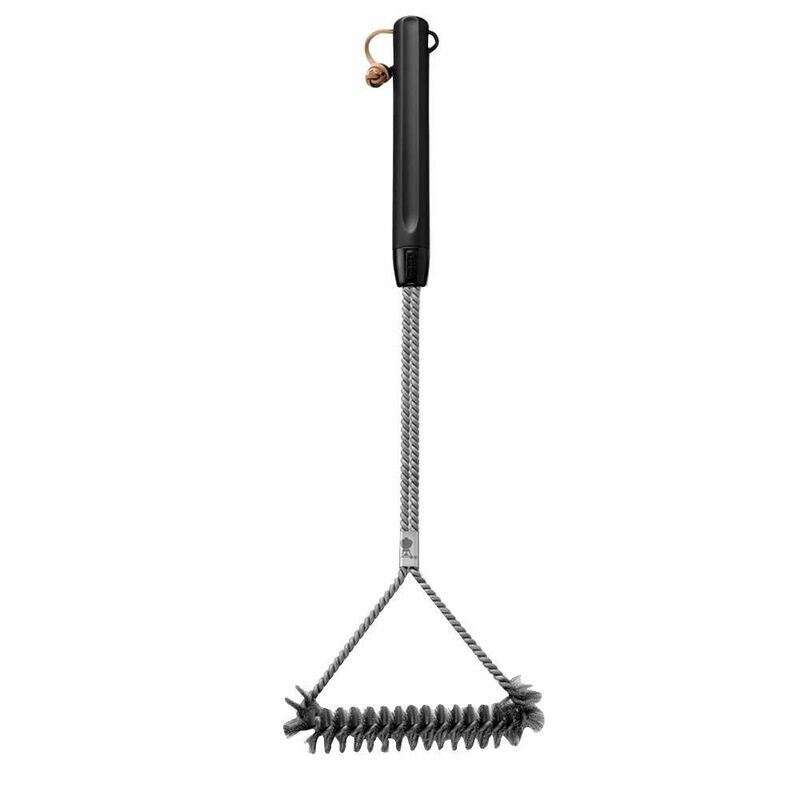 Perfect for cleaning a grill's porcelainized cast iron cooking grids, this grill brush is uniquely shaped to provide leverage when dealing with stubborn food. Pit Boss 12 in. Wire Grill Brush has woven wire brushes in 1 design to improve and simplify cleaning your grill. Removes grease and dirt without scratching. The rust-proof stainless steel bristles ensure a fast and convenient grill grates cleaning. Can be used on all types of surfaces; stainless steel, cast iron, porcelain coated. Great for cleaning LP grills, smokers, pellet grills, charcoal and in fared. Pit Boss XL 21 in. Wire Grill Brush has woven wire brushes in 1 design to improve and simplify cleaning your grill. Removes grease and dirt without scratching. The rust-proof stainless steel bristles ensure a fast and convenient grill grates cleaning. Can be used on all types of surfaces; stainless steel, cast iron, porcelain coated. Great for cleaning LP grills, smokers, pellet grills, charcoal and infrared. The Pit Boss Grill Stone with handle is 100% ecological, non-toxic, way to keep your grill clean. Remove burnt grease, stains, residues and dirt with the all-natural pumice stone. The no-slip grip handle is designed for your convenience of cleaning the hard to reach places of your grill without straining hands or wrists. With each use the stone will shape to any surface for quick deep cleaning. Our Pit Boss Grill Stones work great on all surfaces and types of grills; cooking grates, flat top griddles, utensils and cast iron. A perfect non-toxic grill cleaner safe around kids and pets. 21-inch Stainless Steel Three-Sided Grill Brush Whether you cook on a gas or charcoal barbecue grill, you can use this Weber brush to keep your grill grates free of food debris. With it, you can easily get to hard-to-reach spots between the cooking grate rods, as well as in tight spaces at the edges of the cooking grates. This handy tool has an ergonomic handle to give you a secure grip. 21-inch Stainless Steel Three-Sided Grill Brush is rated 4.1 out of 5 by 370. Rated 1 out of 5 by HomeDepotCustomer from the handle is not stiff enough, it bends too easily.... the handle is not stiff enough, it bends too easily. I had to connect a solid steel bar to it to be ok. Rated 3 out of 5 by Mark from Pretty flimsy, which makes it hard to put any real... Pretty flimsy, which makes it hard to put any real pressure on it while scrubbing. If you put too much pressure on it it will bend. I would have expected better from Weber. Rated 4 out of 5 by RSP from Works well!... Works well! Rated 3 out of 5 by Mason from Not bad, wish the handle could be a little stronger.... Not bad, wish the handle could be a little stronger.